An administrator’s job goes far beyond paperwork. They care for the students and foster a safe learning environment. That includes checking on in-classroom and digital student behavior. New technologies offer ever more efficient ways to monitor students’ behavior and know their well-being. Through monitoring, teachers, administrators, and other school officials will be able to intervene and help students before damage is done. That also increases school safety and ensures a safe learning environment. However, the benefits of proactive student monitoring don’t stop at protecting school districts from liability. In fact, student monitoring can save lives. School violence is a very real threat all educators deal with. In fact, 2018 saw more incidents of gun violence in schools than any year on record. Therefore, some administrators look to deter and defend events at rising costs and mixed outcomes. Others, however, look to stop it before it begins. Monitoring systems can detect — and help administrators defer — threats of potential gun violence on campus. Student monitoring systems serve multiple benefits at no extra costs. The same USA Today article states that in 2018, student monitoring systems stopped 447 student deaths by suicide. LearnSafe’s technology is able to identify students at high risk of self-harm, depression, anxiety, and cyberbullying. LearnSafe embraces accountability for students and educators alike by preventing inappropriate contact between teachers and students. With the advent of social media, digital contact occurs between students and teachers more frequently than ever before. LearnSafe works to ensure digital interactions on school platforms are proper and constructive. 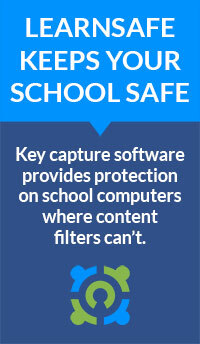 Through LearnSafe’s proactive measures, administrators can keep their school systems safe.